This is my first hike for December because early in the month I took off for Las Vegas for 10 day to enjoy the National Rodeo Finals. Not to much to actually go to the rodeo, but to get to go to some great concerts as a good price and to do a lot of country western dancing at night. Oh yea, during the days I was out Geocaching. Man it was COLD. The average day temperature was probably somewhere around 48 degrees and at night it was down to almost freezing. But that's another story and you probably won't hear it from me. I would be leading the HTMC hike along this trail in March and so it was time to begin checking it out and doing a bit of clearing. It's to long ago to remember to many details about the hike as I'm writing this on March 20th, 2008. I believe this time I was hiking alone as Danny was up to something else. When I hike along I usually get a later start than w/someone else. I probably began the hike sometime around 9:30 a.m. as usual I parked at the forestry gate and then head up the road a few hundred yards taking the first trail after the "speed bump" to the right. The trail is marked with light blue bottle caps. 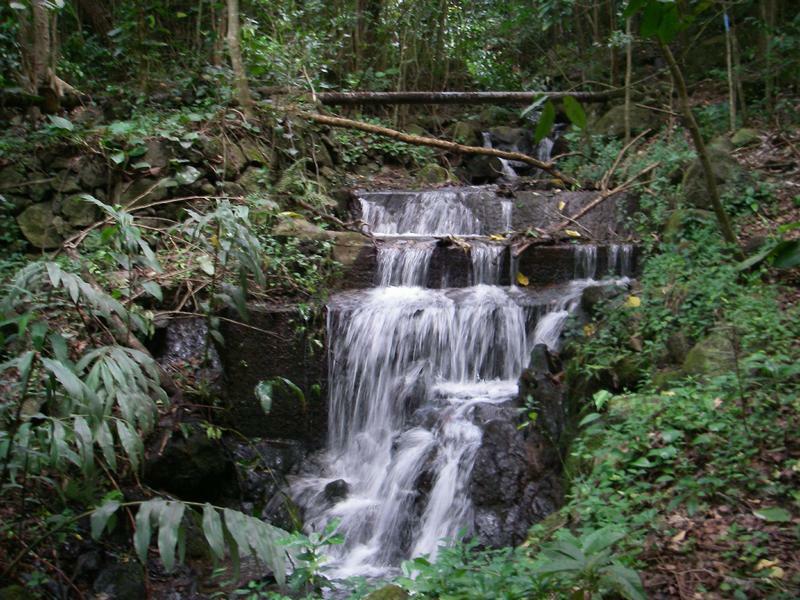 After about 25 minutes I reached the first dam on Kanewai stream. Looking from the low side of the dam, this picture show how water was diverted from the stream into a ditch which at onetime flowed into an open flume. 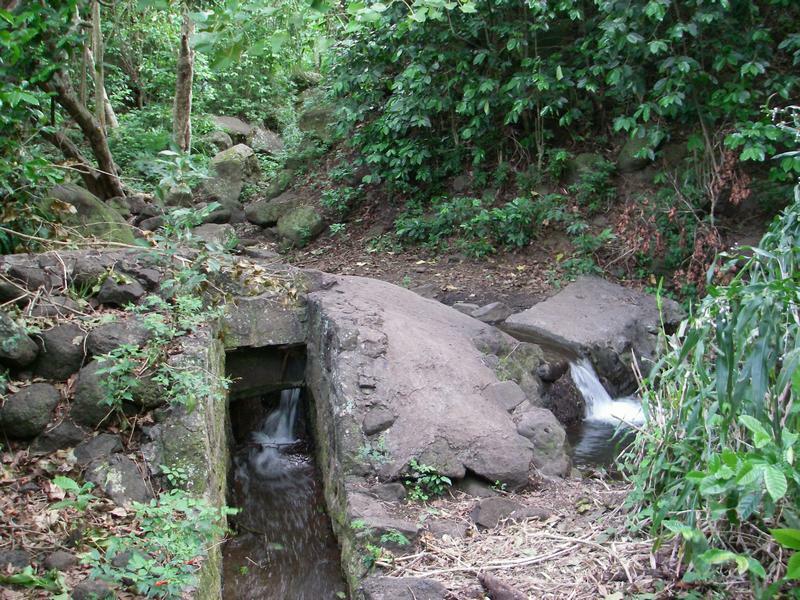 Now most of the water goes back into the stream except for a small amount which flows into two 3" PVC pipes and goes down to the Ka`ala Learning Center to water the Kalo loi there. About 35 minutes along the trail from Kanewai Dam #1 is Kanewai Dam #2. This dam once fed a flume which you can see laying in ruin if you click on the picture and watch the Quick Time video. Be warned that it is a big file and if you don't have a fast internet connection it could take a very long time. Make sure your sound is turned up so you can listen to the sound of running water.